Native to New Zealand’s North Island. Evergreen shrub to 2m, can be grown as a climber. 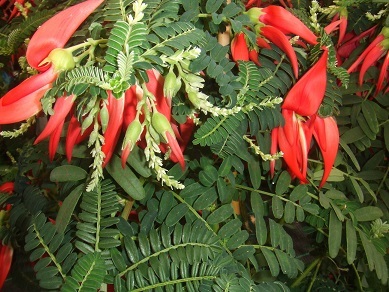 Flowers are red and named after their resemblance to the beak of the Kaka parrot. Flowers spring to summer in pendulous clusters. Not frost tolerant. Native to New Zealand. 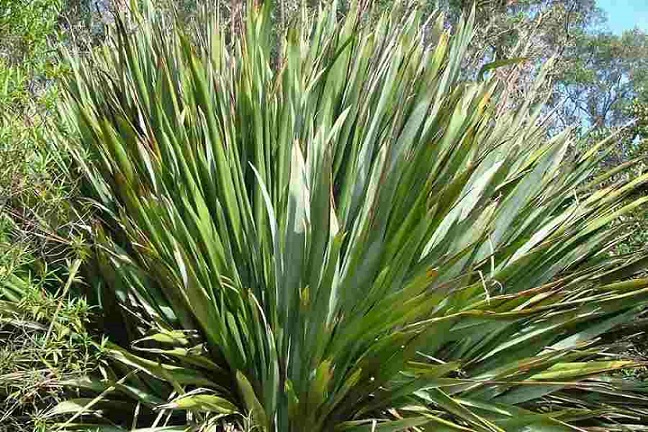 Grows to 1.5 m tall and wide with a clumping habit. Leaves are large and sword-like. Grows in sun to part shade, is drought tolerant, low maintenance, tolerates coastal conditions and is suitable for garden and container plantings. Native to eastern Australian rainforests. 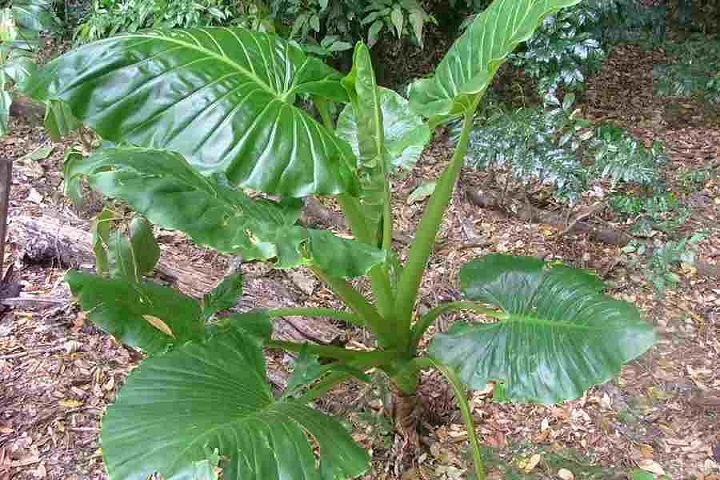 Grows up to 1.5 m. Large, glossy green leaves, suitable for shady garden plantings. Scented, green/cream coloured flowers appear in summer followed by red fruit. 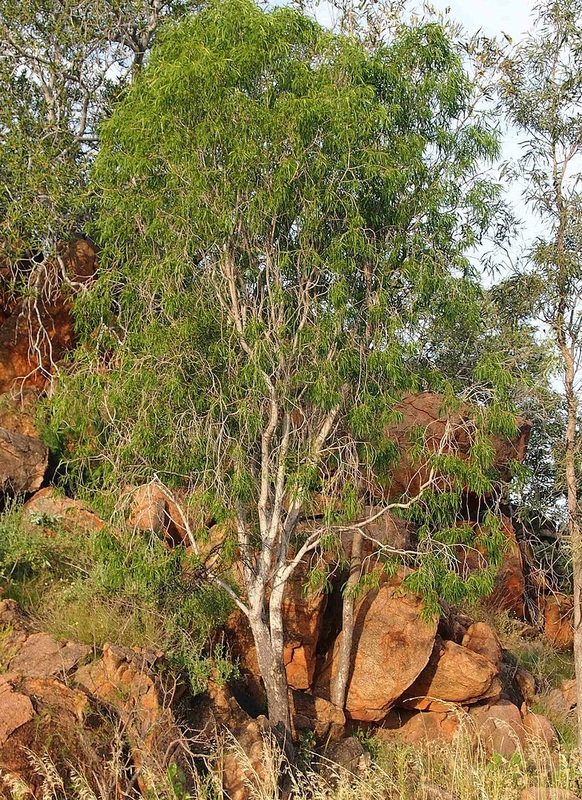 A rainforest tree native to Queensland and New South Wales. Can grow up to 20 m in natural environment. Fragrant yellow flowers appear September to October, attractive to bees, honey-eating birds and butterflies. Will grow in shade but flowers best in full sun. Protect from frosts until established. Deciduous native to southern Mexico and northern South America. Grows 16 to 30 m tall with a spreading canopy. Flowers at various times of the year in response to dry weather. 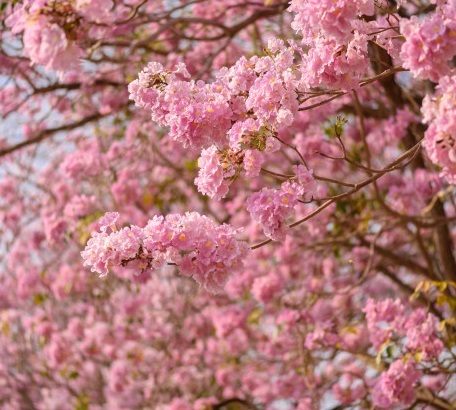 Trumpet shaped flowers are shades of pink and appear while the tree is leafless, creating a massive pink floral display. Prefers full sun and is salt tolerant. A pioneer rainforest species native to eastern Australia, growing to 25 m with an open spreading habit. White flowers appear in December. Prefers full sun and is very hardy. 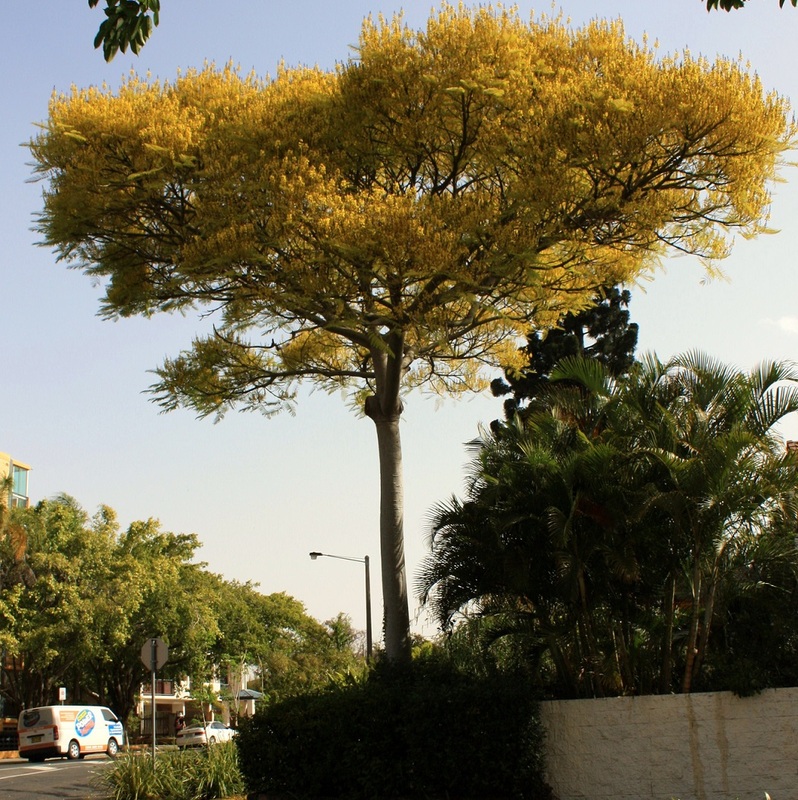 Native to tropical South America, fast growing to 40 m with a single, straight trunk up to 80 cm diameter, branching only at the top of the tree. Nectar producing flowers appear October to December in masses. Prefers full sun and open position. A vigorous evergreen climber native to eastern Australia. 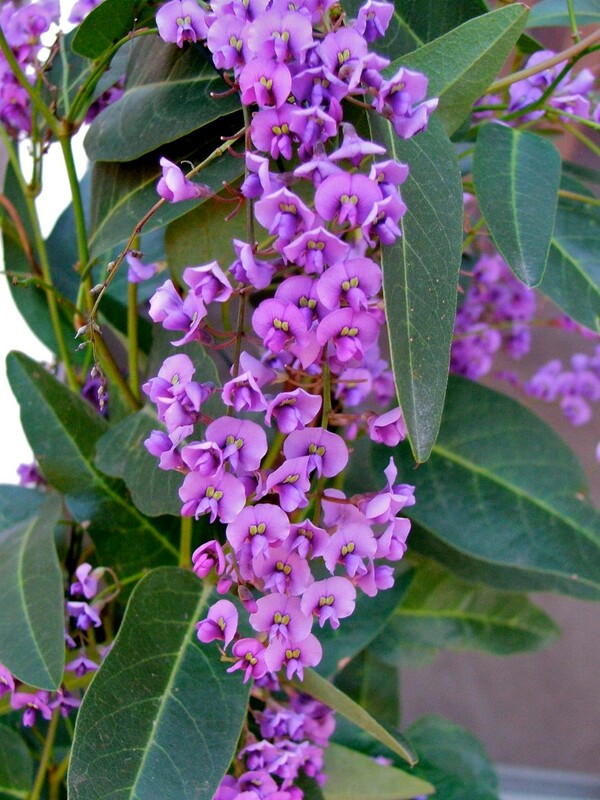 Grows to 6m, dark green leathery leave and masses of pea-like flowers winter to spring. Flowers usually purple but can be pink or white. Prefers sunny to semi-shaded positions but flowers better in full sun. Good for covering fences and walls. Regenerates after fire. 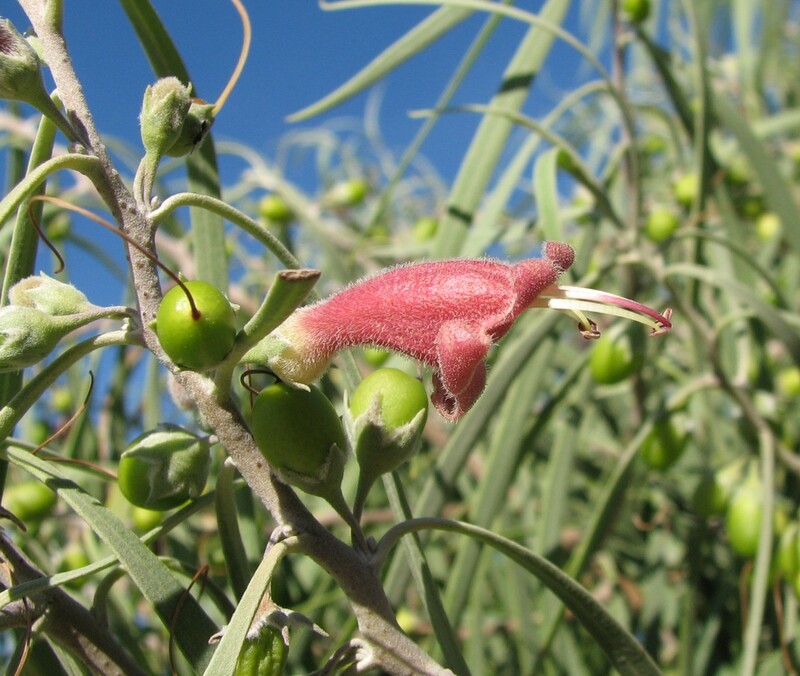 A mallee native to New South Wales with very small natural distribution. An interesting Gum as it retains its juvenile foliage into maturity, rarely growing adult leaves. Foliage is silver-grey. Flowers are cream and appear in clusters of three between May and November. 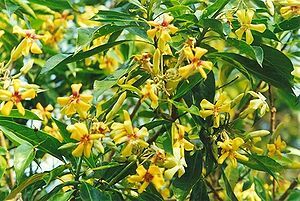 Used as an ornamental garden and landscaping tree and cut foliage in floral displays. 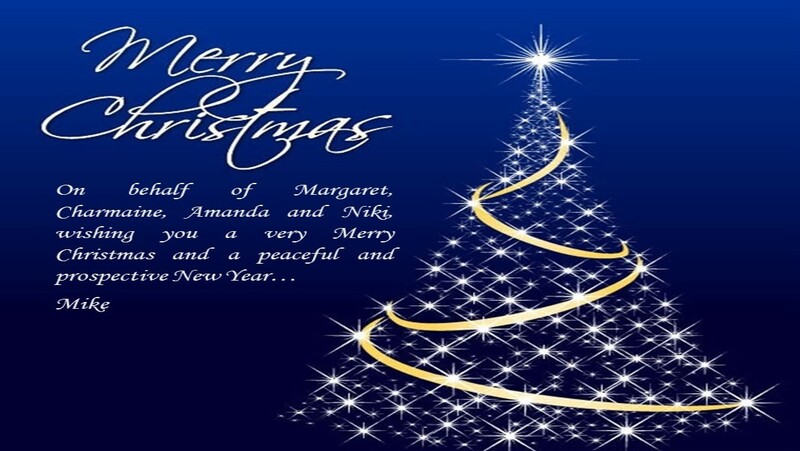 Our January February 2019 Newsletter and Fresh Harvest List are now available! 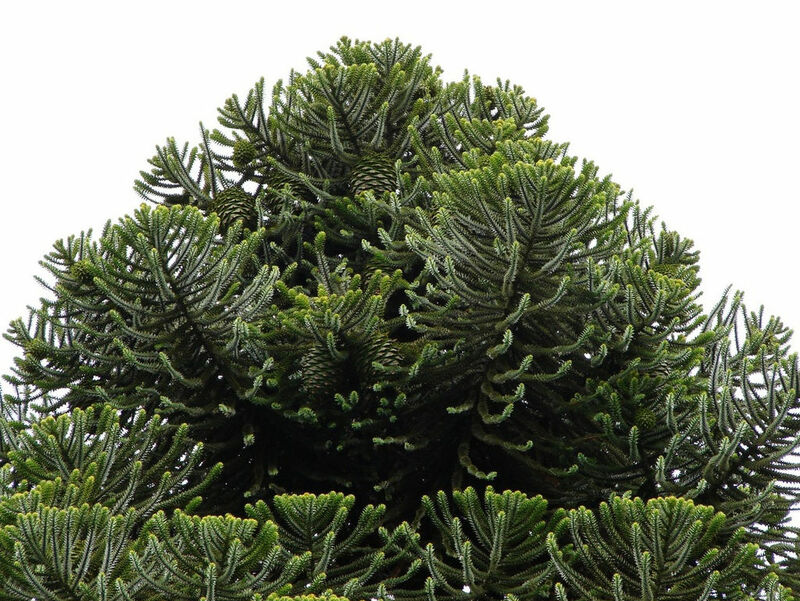 Native conifer to Queensland and New South Wales, growing to 60 m and living to about 450 years old. 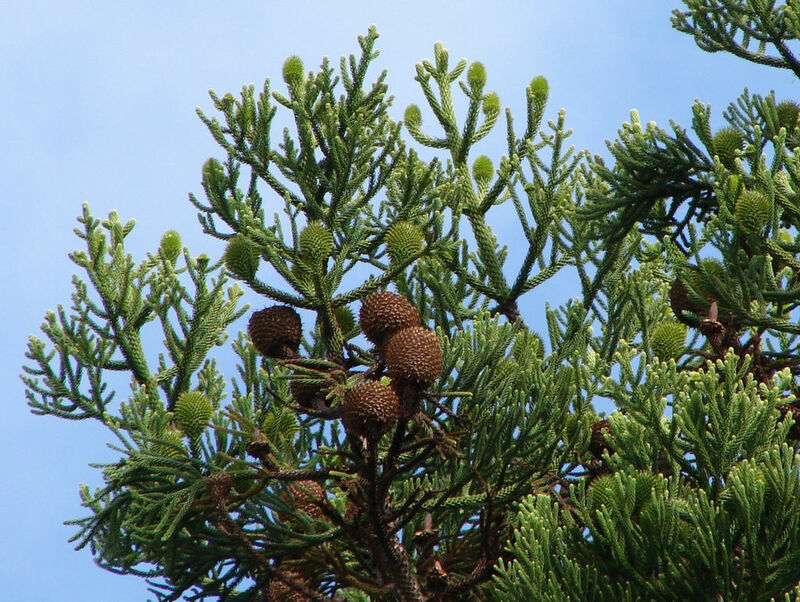 Cones are about 8 cm diameter and disintergrate at maturity, releasing the edible seeds. Produces high quality timber. Prefers sub-tropical climates. 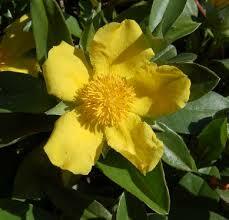 Small to medium shrub with a climbing habit of dark green glossy leaves and bright yellow flowers spring/summer. Common in cultivation, adaptable to a wide range of growing conditions but flowers best in full sun. Fairly vigourous and tolerant of salty coastal conditions and moderate frost. Excellent screening plant for fences and walls. Natural distribution is throughout southern Australia. 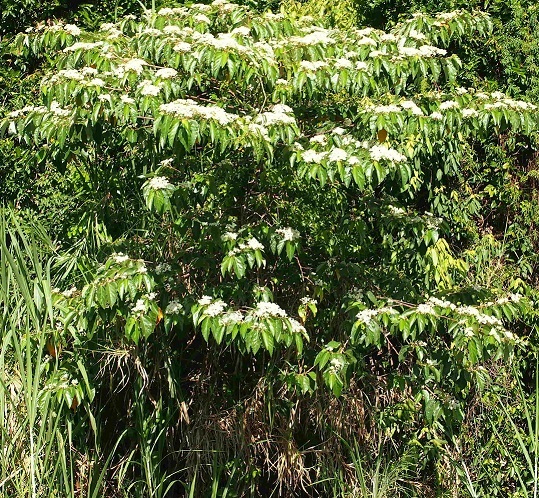 A tall shrub/small tree growing 4 to 6 m high and 2 to 4 m wide. Leaves are slender and pale green. Fragrant flowers are green or white on the outer and red/brown on the inner. 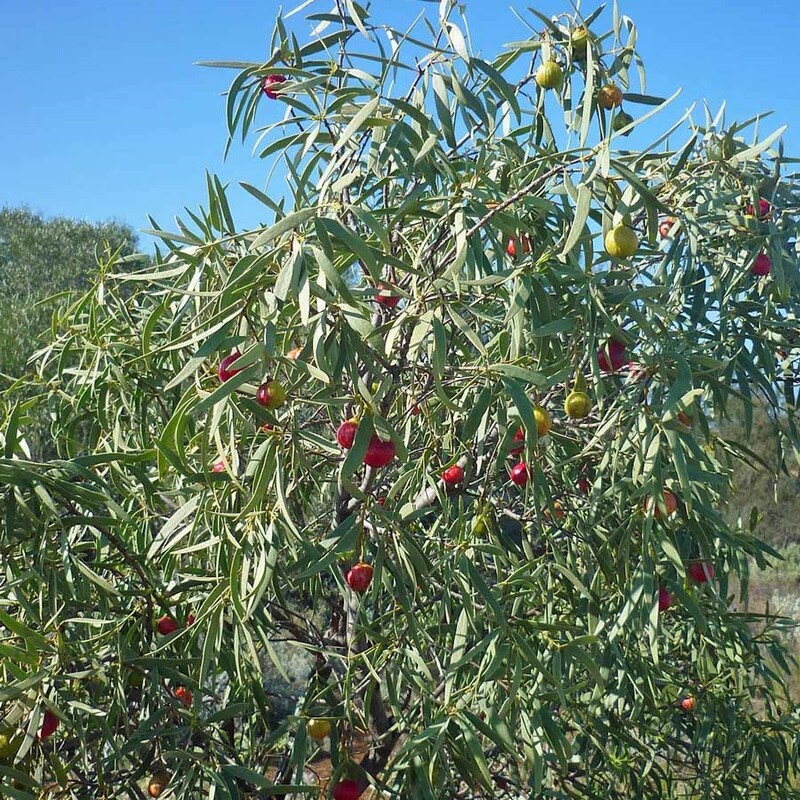 The fruit is a bushfood, ripening from green to shiny red in late spring/summer. Tolerates salt, drought and heat and can grow in poor quality soils. A small perennial shrub 1 m in diameter occurring throughout most of Australia. Blue/green cylindrical, hairy leaves cover the bush all year. Fruits ripen from green/yellow to red/orange. The fruit is edible, described as sweet-salty. Highly drought tolerant an adaptable to various soil conditions. A popular source of food for emus. A shrub/small tree growing 1 to 8 m, occurring throughout most of Australia in drier climates. Flowers are red to pink, flowering time is regional, spring/summer in Queensland, followed by yellow fruits that ripen brown to black. Grows in a wide range of soil types and habitats except high humidity coastal regions. Tolerant of heat, drought and regenerates well after fires. We advise of availability of this rarely available, highly desirable tropical Acacia.